AHTML. Generates an HTML version of the chart. FLEX. Generates an SWF file for the chart that is compatible with Adobe Flash Player. APDF. Generates an SWF file for the chart that is compatible with Adobe Flash Player, embedded in a PDF file. The output formats (AHTML, FLEX, APDF) support BY syntax in the GRAPH FILE procedure. They do not support ACROSS syntax. Make sure to code your GRAPH FILE procedures using BY. The active dashboard features work the same way when the COMPONENT is GRAPH FILE with FORMAT AHTML, FLEX, or APDF. 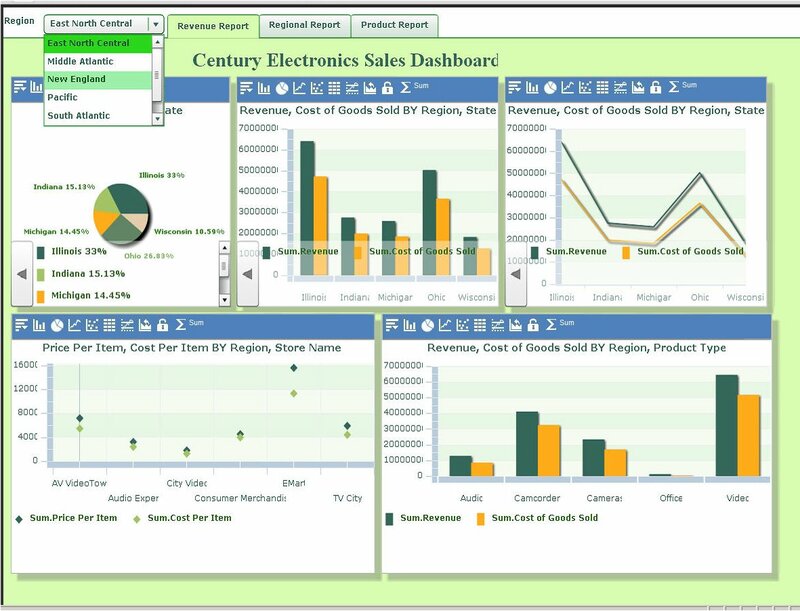 Examples of active dashboard features include MERGE=AUTO, the global filter menu, and the chart menu. If you do not specify a chart type, the default chart type is BAR. When you create an active chart using GRAPH FILE syntax, GRAPH FILE automatically sets the initial chart size to 768 x 480 pixels by default. This feature applies to all chart engines. Displays the chart output in a web browser in the format specified. PCHOLD is the default value. Saves the chart output to a temporary file for later use. The output is saved with an associated Master File. Saves the chart output to a file for later use, but the output is not saved with a Master File. Creates an HTML version of the chart. Creates an Adobe Flash Player version of the chart (Adobe Flash file). Creates an Adobe Flash Player version of the chart (Adobe Flash file), embedded in a PDF file. The following WebFOCUS code creates an Adobe Flash Player version of an active chart. The code that controls the chart type (PIE) and the code that controls the output format (FLEX) is shown in bold. The WebFOCUS StyleSheet code, which follows the code shown in bold, controls the way that the legend is displayed in the output. In this example, the legend is fixed. It appears underneath the chart. For more information on controlling the legend, see Controlling the Legend of an Active Technologies Chart in FLEX or APDF Format. You can use the icons at the top of the chart as you do for charts that are generated by a graphical tool. For example, you can change the chart type from pie to bar. The Chart Tool is accessible from the left-most icon at the top of the chart. The Chart Tool allows you to change the columns and switch the chart type. You can control the chart type using the WebFOCUS code ON GRAPH SET LOOKGRAPH. Is the WebFOCUS HTML5 chart engine in WebFOCUS 8 and higher. 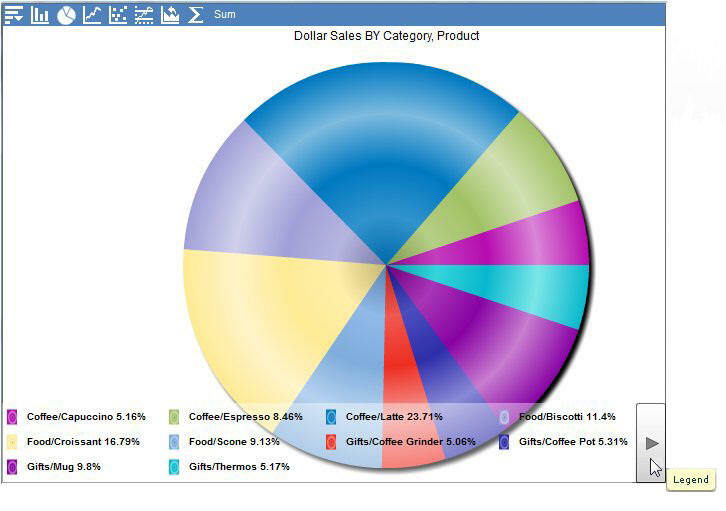 This is the default chart engine in InfoAssist and other reporting tools for Active Technologies in WebFOCUS 8 and higher. 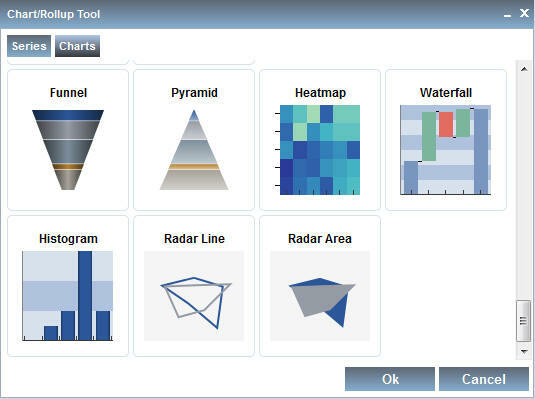 This is the default chart engine in InfoAssist and other reporting tools for Active Technologies in WebFOCUS Reporting Server Release 7.7 Version 03 and higher. Information Builders has tested the performance of all available chart engines, that is, the time that it takes for a specific chart engine to run an active chart. The performance of the Fusion chart engine is comparable to that of any other chart engine. Uses the Active Technologies legacy chart engine, which includes the four default chart types. If you do not set ARGRAPHENGINE in a procedure, the default behavior is ARGRAPHENGINE=DEFAULT. Uses the Adobe Flex legacy chart engine when the output format is FLEX or APDF. You can also specify ARGRAPHENGIN instead of ARGRAPHENGINE. In a compound layout report, you must set ARGRAPHENGINE at the COMPOUND level, that is, in the SECTION declaration or in the first report or chart component in the COMPOUND syntax. Using the SECTION declaration syntax in a compound layout report. The specified chart engine (JSFUSION) will be used for all reports on the active dashboard. 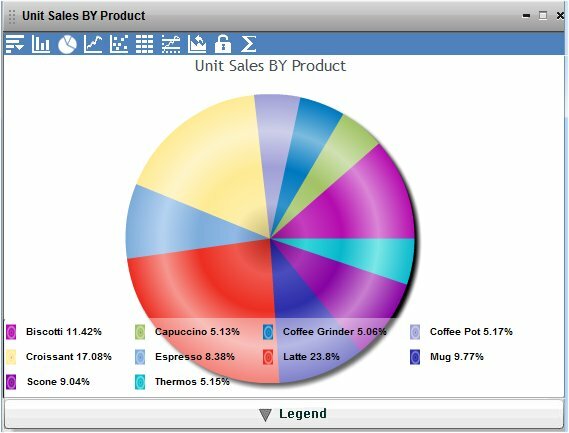 You can control the display of the legend and mouse over data tips for an active chart in AHTML format. Using WebFOCUS StyleSheet code, you can either exclude or include the calculation type in the legend and data tips. Examples of the calculation type are Sum, Avg, and Min. This feature applies only when you are using the Active Technologies legacy chart engine (ARGRAPHENGINE=DEFAULT), which includes the four default chart types. For more information on the ARGRAPHENGINE syntax and settings for the chart engine, see Switching the Chart Engine. Excludes the calculation type from the chart legend and mouse over data tips. This is the default value. Includes the calculation type in the chart legend and mouse over data tips. The display format is field_name(calculation_type), where calculation_type is a value such as Sum, Avg, Min, Max, Count, or Distinct. An example of a legend that includes the calculation type is Dollar Sales(Sum). includes the calculation type in the legend and mouse over data tips on an active chart, as shown in the following image. In this example, the calculation type is Sum. You can control how to display the legend for an active chart in FLEX or APDF format, using WebFOCUS StyleSheet code. The legend can be fixed or collapsible. When the legend is fixed, it appears underneath the chart. You cannot hide, collapse, or expand the legend. When the legend is collapsible, you can hide it or show it. You can also choose the position of the Legend icon on the chart. Collapsible is the default value for the display of a legend, with the Legend icon positioned at the bottom left of the chart. A legend always appears on a pie chart. A legend appears on a bar, line, or scatter chart if the chart has more than one Y-axis field. The following WebFOCUS StyleSheet code generates a collapsible legend at the bottom-right of an active pie chart in FLEX format. The output is shown in the following image. In the image, the cursor is pointing to the Legend icon at the bottom-right of the chart. Click the up arrow and the down arrow on the scroll bar on the Legend icon to display the complete list of items in the legend. Click the right arrow on the Legend icon to hide the legend. When the legend is hidden, the arrow points left. Click the left arrow on the Legend icon to show the legend. The examples in this topic describe the supported chart legend syntax and the output that it generates. The chart that is generated runs inside a canvas frame, not inside a window or panel type of frame. When you run a TABLE FILE procedure and you do not set the initial report view to a chart, WebFOCUS generates an active report that is in grid view. You can create a chart from a drop-down menu on the active report, using the Chart menu option. When you do that, the chart opens up inside a new window or panel type of frame. You can minimize, maximize, or close the window. If you do not specify WebFOCUS StyleSheet syntax for a chart legend, by default WebFOCUS sets LEGEND-VIEW to DOCKING, and POSITION-POINT to BOTTOM-LEFT. The WebFOCUS syntax generates the chart legend, as shown in the following image. If LEGEND-VIEW is FLAT, the legend appears underneath the chart and there is no Legend icon. In this scenario, the POSITION-POINT does not apply. If the legend POSITION-POINT is BOTTOM-CENTER, you can expand or collapse the legend below the chart. If the legend POSITION-POINT is BOTTOM-RIGHT, you can expand or collapse the legend at the bottom-right of the chart. By default, the chart colors are stored in the irpstd.js file, located in the WebFOCUS Reporting Server \home\etc directory. The colorTable has been moved from the irpfnc.js file to the irpstd.js file, starting with WebFOCUS Reporting Server Release 7.7 Version 03. By default, the chart styles are stored in the irpfsty.js file, located in the WebFOCUS Reporting Server \home\etc directory. The numbers represent the array of colors for active chart series using colorTable RGB color codes. Enter the series color of your choice separated by commas, no spaces, and brackets. The following image shows an active dashboard, using the HTML output format, with customized chart colors. Here are the steps that you follow. In your application folder, create a new, empty text file. Name it irpuflex.js. Copy the styling section of the irpfsty.js file from the WebFOCUS Reporting Server location (\home\etc directory), and paste it into the irpuflex.js file in your application folder. Alternatively, you can copy the styling section of the irpfsty.js file that you renamed in step 2, and paste it into the irpuflex.js file in your application folder. This should be the same directory as the location of the active report or active dashboard. For example, from the Projects on localhost area in Developer Studio, create the irpuflex.js file in the Other subfolder of the project folder. Tip: Cascading style sheet syntax uses HTML color code or hex values for the colors. For details on each available property, see the Adobe documentation. 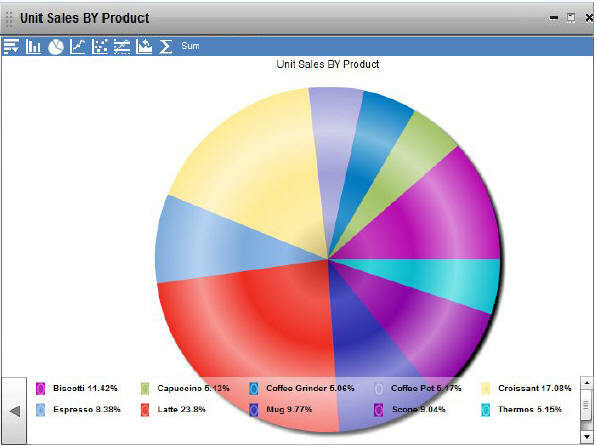 For Pie Chart styles, you can modify properties for arPieSeries1 of arPieChartStyle. Currently, you may only modify the first series in a pie chart of the active report for Adobe Flash Player. A single array of colors to specify the individual color for each pie chart wedge. The color of the text used in the chart, including the label. Sets the text to be in boldface. 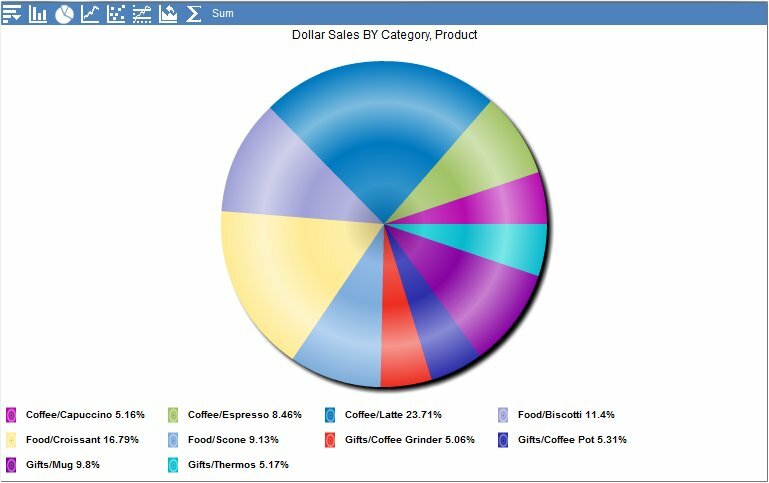 Displays labels with lines from each label to the associated wedge in two vertical stacks on either side of the Pie Chart. Note this shrinks the size of the Pie chart and labels if necessary to fit them in the space provided. Displays labels inside the chart. 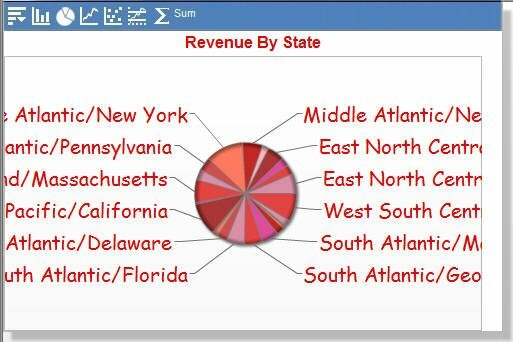 Displays labels inside the pie chart, and converts them to callout labels if labels are shrunk below a legible size. Displays labels outside the chart. For Bar Chart styles, you can modify each arBarSeries property of arBarChartStyle. You can add as many series as needed. The number of series specified in the array for arBarChartStyle has to correspond with the number of bar series defined. Sets the color for each series in a chart. For Line Chart styles, you can modify each arLineSeries property of arLineChartStyle. You can add as many series as needed. The number of series specified in the array for arLineChartStyle has to correspond with the number of line series defined. Draws angled lines to connect each data point in the series. Draws curves between the data points. Draws a horizontal line on each data point. Draws a vertical line on each data point. The length is determined from the y-coordinate of the first point to the y-coordinate of the second point. Draws a horizontal line at the first data point, then a vertical line to the second point, and repeats to create steps for each data point. Draws a vertical line at the first data point, then a horizontal line to the second point, and repeats to create reverse steps for each data point. Sets the color of the line. Sets the width of the line in pixels. The default value is 0. For Scatter Chart styles, you can modify each arScatterSeries property of arScatterChartStyle. You can add as many series as needed. The number of series specified in the array for arScatterChartStyle has to correspond with the number of scatter chart series defined. Sets the radius of the plot point in pixels. The default value is 5 pixels. You can also apply styles to the legend and change the background color of the Bar, Line, and Scatter chart. Moreover, when generating an active dashboard for Adobe Flash Player and for PDF, the dashboard is compiled with the native controls, namely, TabNavigator and ComboBox. You can create the style sheet for TabNavigator and ComboBox using cascading style sheet syntax, and apply it to your active dashboard to style the dashboard further. The following image shows an active dashboard for PDF with fully customized style. In your application folder, create a new, empty text file. Name it irpcusf.js for active reports and dashboards in HTML, and irpuflex.js for active reports and dashboards for Adobe Flash Player. Note: For active reports and dashboards for Adobe Flash Player, the chart styles in the Chart/Rollup Tool dialog box will change dynamically, according to the changes made in the irpuflex.js file. Both files follow the same style property convention that corresponds to the properties defined in the FusionCharts documentation. For more information on a specific property, see the FusionCharts product documentation, located at http://www.fusioncharts.com/docs/. For active reports and dashboards in HTML formats, these properties are defined in the fcinfo variable in the irpfusc.js file. For active reports and dashboards for Adobe Flash Player, these properties are defined in the getFCGlobal function in the irpfstd.js file. Each chart type has its corresponding chartParams name assigned in these functions and all the chart styling properties are defined in each chartParams section of the files. You have full control over styling individual chart types by assigning a different chartParams name to each chart type. For example, you can apply different sets of colors to Pie 2D, Multi-series Column 2D, Multi-series Line 2D, Scatter, or any other advanced chart types as needed. In addition to changing chart series colors, you can customize the labels to display inside or outside the pie chart types, change the default font type or colors used globally, add background color to the chart canvas, change legend color or mouse-over data tip colors, and so on. In your application folder, create a new, empty text file, and name it irpcusf.js (or irpuflex.js). Copy the styling section of the irpfusc.js file (or the irpfstd.js file) from the WebFOCUS Reporting Server location (\home\etc directory), and paste it into the irpcusf.js file (or irpuflex.js file) in your application folder. This should be the same directory as the location of the active report or active dashboard. For example, from the Projects on localhost area in Developer Studio, create the irpcusf.js file (or the irpuflex.js file) in the Other subfolder of the project folder. In the fcCategory section, locate the chart type you need to modify. This is defined in the swfName parameter. Locate the corresponding chartParams parameter name. The chartParams parameter name is defined separately and contains all of the properties used to style each chart type in the swfName parameter. For example, in order to modify a Pie 2D chart, locate the Pie2D value in the swfName parameter, as below. 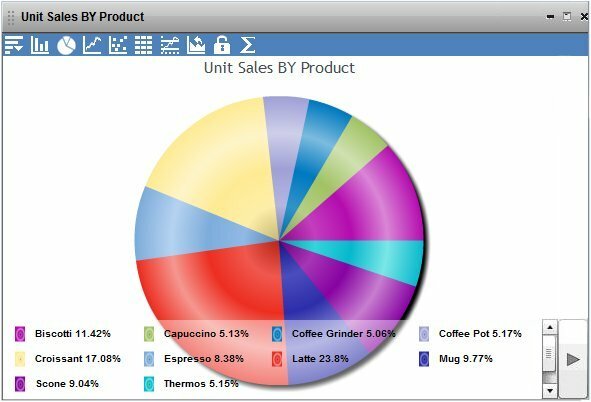 The chartParams called pieParams contains all of the properties you can modify to change the look and feel of the Pie 2D chart. Note: It is recommended that you create a new chartParams name for the chart types you are modifying because the same chartParams name may be assigned to other chart types that you may not need to modify. 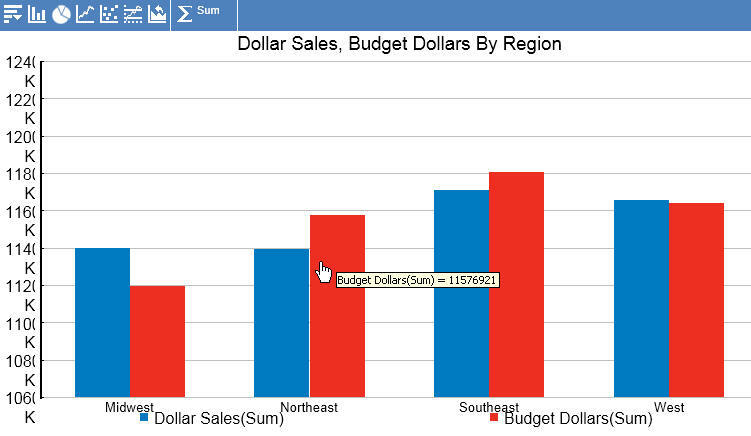 You can also create one default chartParams name and assign it to all chart types to globally apply the same styles. For active reports and dashboards in HTML formats, locate the chart properties section defined in fcinfo.chartParams_name. For example, fcinfo.pieParams. For active reports and dashboards for Adobe Flash Player, locate the chart properties section defined in this.chartParams_name. For example, this.pieParams. The values on the left-hand side correspond to chart element attribute names defined in the FusionCharts documentation, and the default values used in advanced active charts are set on the right-hand side, wrapped in double quotation marks. Copy the entire fcinfo.pieParams section (or this.pieParams section) into clipboard and paste it under the pieParams section. Rename the copied section as fcinfo.testParams (or this.testParams). In the fcinfo.fcCategory section (or this.fcCategory section), change the chartParams name for the Pie 2D chart to testParams. For active reports and dashboards for Adobe Flash Player, define the new testParams name as a variable with array type before the getFCGlobal function starts. Note: In the preceding examples of code, the ellipses indicate additional lines of code. If you are modifying the irpuflex.js file for active reports and dashboards for Adobe Flash Player, you are almost ready to customize the styles and run a chart. There is one more editing step to perform in the irpuflex.js file. You can now modify the values assigned for each chart style property in the testParams section, or add or remove each chart style property. For example, the attributes, such as baseFont, baseFontSize, and baseFontColor, define the generic font properties for all the text used on the chart inside the chart canvas, including data labels, values, and so on. baseFont. 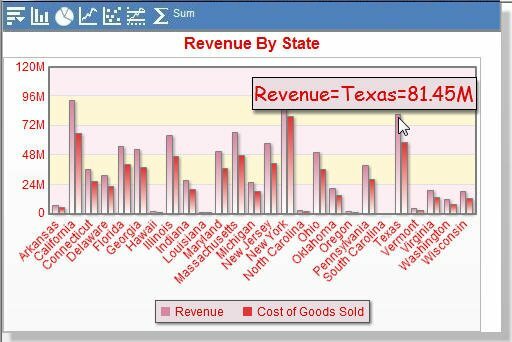 Specify the font family name to be used for all the text (data labels, values, and so on) on the chart inside the chart canvas. baseFontSize. 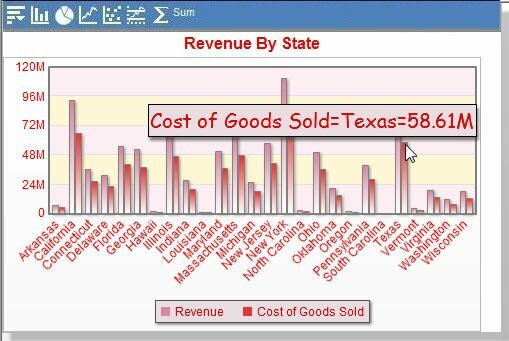 Specify the font size to be used for all the text (data labels, values, and so on) on the chart inside the chart canvas using a numeric value between 0 to 72.
baseFontColor. Specify the font color to be used for all the text (data labels, values, and so on) on the chart inside the chart canvas using the HTML color code. Do not include the number (#) character when using the HTML color code. 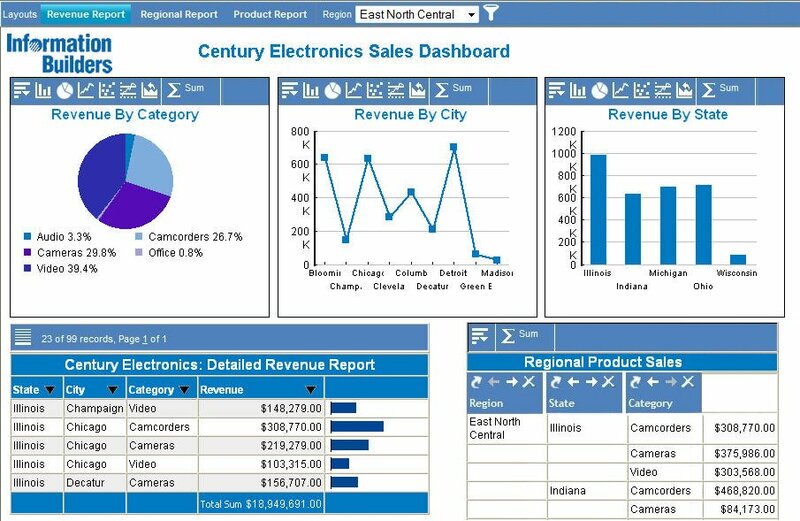 The chart series colors are defined in the paletteColors property for active reports and dashboards in HTML formats and in the paletteColors property for active reports and dashboards for Adobe Flash Player. In order to change the chart series color, you need to define a set of colors for these properties. paletteColors. Specify a list of HTML color codes separated by commas. Do not include the # character when using the HTML color code. The chart cycles through the list of specified colors. For example, the following set of eight colors changes the color of pie chart slices into a red color scheme. Open the Chart/Rollup Tool dialog box if you have the modified irpuflex.js file for active reports and dashboards for Adobe Flash Player. 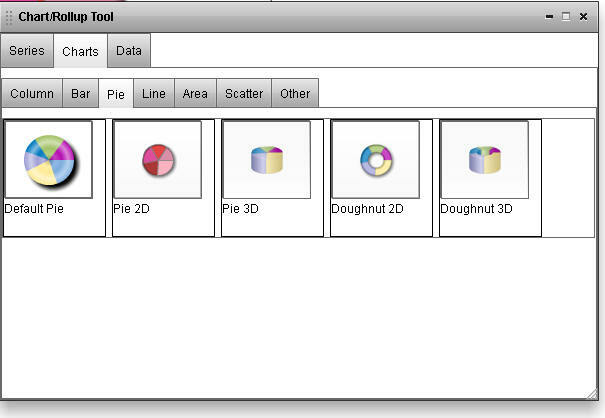 Notice the same style changes are reflected for the Pie 2D chart in the Chart/Rollup Tool. Because testParams is assigned only to the Pie 2D chart type in this example, the other charts still retain the default chart styles specified in other chartParams parameters. You can apply the same chartParams name to other chart types to change their styles. For example, change the chartParams name for the Multi-series Column 2D chart as below. The same red color scheme is now applied to the Multi-series Column 2D chart. 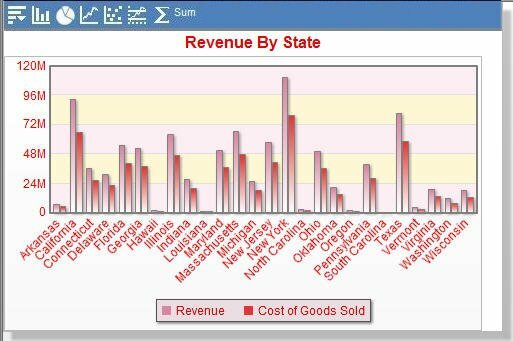 You can change the alternating background color of the chart canvas for chart types such as column, bar, line, and area. In the testParams section, locate the canvasBgColor property, and change its value as follows. If the canvasBgColor property does not exist, you can simply add it. For alternating background color, locate the alternateHGridColor property, and change its value as follows. If the alternateHGridColor property does not exist, you can simply add it. Depending on the chart type, different types of properties are available to modify multiple areas of the chart. For more information, see the FusionCharts documentation. The chart now contains light pink and yellow alternating background color. Adding or modifying the following properties changes the background colors used in the mouse-over data tip and legend. The SET ARNOPRINTHIDE command enables you to specify how the server handles a hidden BY column when NOPRINT is used in a GRAPH request. This command applies when the setting for the chart engine is JSCHART. Excludes a hidden BY column (BY column with the NOPRINT option) from the sort processing of an active chart. Data for the hidden BY column is not displayed in the active chart output. This is the default value. Using this setting with a NOPRINT column produces the same result as using HIDE=ON syntax for the BY column in the procedure, as described in How to Control the Hide Column Options. The data for a hidden BY column is available for use elsewhere. For example, you can use it to populate the global filter drop-down list or other filter control on an active dashboard. Includes a hidden BY column (BY column with the NOPRINT option) in the sort processing of an active chart. The chart is sorted by all the hidden BY columns, and data from all the columns is displayed in the active chart output. You can suppress the display of the chart tool bar using WebFOCUS StyleSheet code. This feature is available for active reports that are published in AHTML, FLEX, or APDF format. Once you suppress the display of the chart tool bar, you can no longer switch the chart type during run time from within the chart window. This feature is not available in Developer Studio. 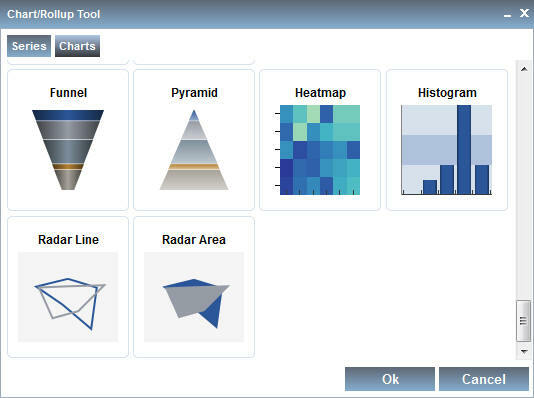 Displays the chart tool bar. This is the default value. By default, when a user clicks a riser on an active chart, two filter options are displayed in the tooltip that appears. They are Filter Chart and Exclude from Chart. Using WebFOCUS StyleSheet code, you can suppress the display of the filter options. When the user clicks a riser on the chart, the options are not available, and filtering through the tooltip is disabled. This feature is available for an active chart with output format AHTML. This feature is not available in the GUI. Displays the filter options in a tooltip when a user clicks a riser on the chart. This is the default value. A table of default colors. These are the color definitions for the gridlines, labels, risers, and other chart primitives. They are standard JSON color objects, so you can specify hex value (#FF0000), default colornames (red), or RGB/RGBA values (rgba(126,188,224,0.7)). A table, tdginfo, to control the visibility of chart icons in the Chart Roll Up Chart Picker dialog. In this table, you can change the value of any showInTool entry from true to false to remove that icon from the chart picker. barProps. All Bar and Column charts. pieProps. All Pie and Donut charts. otherProps. All other charts, such as Heatmap. Here is barProps blob. Try changing introAnimation:enabled property from true to false to disable the growing riser animation effect.